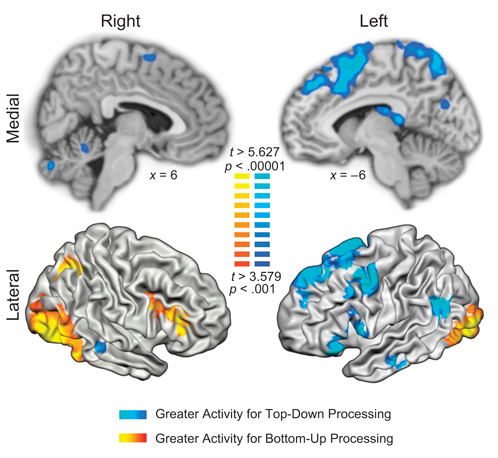 Ochsner et al use MRI to examine what is now becoming a common distinction, to consider the extent to which emotions arise via low-level processes that provide quick, bottom-up affective analyses of stimuli, versus high-level, top-down cognitive appraisal processes that draw upon stored knowledge. They did this by examining responses in trials with normatively aversive images (bottom-up trials) and also in novel trials in which participants cognitively interpreted neutral images as aversive (top-down trials). Here is the abstract, followed by a summary figure. I've always thought it's nice that the "top-down", "higher thought processing" parts of the brain, roughly speaking, are literally on top of the "lower" bits, at least when you're standing up!